Report of the President to the Trustees Architecture always held a fascination for Andrew Dickson White. As a ten-year-old boy, he was enthralled by the engraved plates of English landscapes and architectural renderings in The Gallery of British Artists. He continued his interest while a student at Yale University. After graduation, he traveled through Europe, visiting cathedrals and monuments, noting and commenting on them in his diaries. He began to acquire books and journals on architecture. When he returned to America, he accepted a position teaching history at the University of Michigan. While at Michigan he used for his history courses much of the illustrative material he had collected on art and architecture. He also worked to beautify the campus by planting trees, and became superintendent of grounds with a seventy-five dollar annual budget. He returned to New York, and in 1864, was elected to the New York State Senate, where he met Ezra Cornell. On February 7, 1865, White introduced into the Senate a bill to establish Cornell University. He was asked to prepare bylaws, and his Report of the Committee on Organization provided a detailed description of his conception of the new university, both intellectual and physical. Among other elements, the plan called for a chair in architecture as one of the first that would need filling. The Trustees applauded Whites report and unanimously elected him the first president of Cornell University. 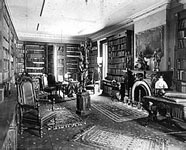 Three years later, White proposed to give his architectural library, his "pet extravagance," to the university in return for the creation of a department of architecture. The Trustees approved and appointed Charles Babcock as the first professor of architecture in the United States. Andrew Dickson White retained his passion for architecture throughout his life, and played a crucial role in the growth of the architecture program and in the development of the Cornell campus.